Cervical cancer is a common gynecologic cancer in women greater than age 65. The standard treatment for advanced disease in the general population is chemoradiation, and evidence suggests that elderly patients tolerate radiation therapy well. More prospective trials are needed in the elderly population to determine the superiority of chemoradiation over radiation alone or neoadjuvant chemotherapy followed by surgery. The standard treatment of metastatic or recurrent cervical cancer is chemotherapy. While studies suggest that age alone should not influence the use of chemotherapy in the elderly population, physiologic changes, medical comorbidities, and performance status of each individual must be considered. Dose reductions or altered regimens may therefore be appropriate. 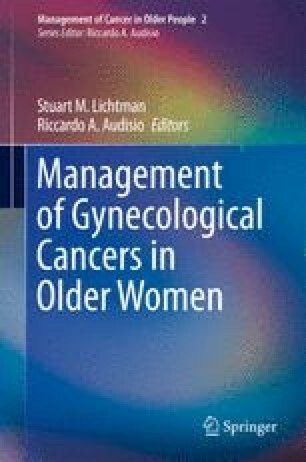 Several new therapeutic drugs and strategies are currently under investigation for advanced disease as well as metastatic and recurrent disease, and prospective evidence specific to this population will be needed to evaluate the efficacy of these strategies for elderly women with cervical cancer. American Cancer Society Guidelines for the Early Detection of Cancer. American Cancer Society. Last Medical Review: 02/25/2010. Last Revised: 06/23/2011 (http://www.cancer.org/Healthy/FindCancerEarly/CancerScreeningGuidelines/american-cancer-society-guidelines-for-the-early-detection-of-cancer). Accessed 10/12/11. ACOG Announces New Pap Smear and Cancer Screening Guidelines. American Congress of Obstetricians and Gynecologists. 2011. (http://www.acog.org/ACOG_Districts/dist_notice.cfm?recno=13&bulletin=3161). Accessed 10/12/11.